We all know that The Walking Dead writer Robert Kirkman knows his way around zombies. That’s a skill he gets to use to great effect in the Marvel Zombies series together with artist Sean Phillips. 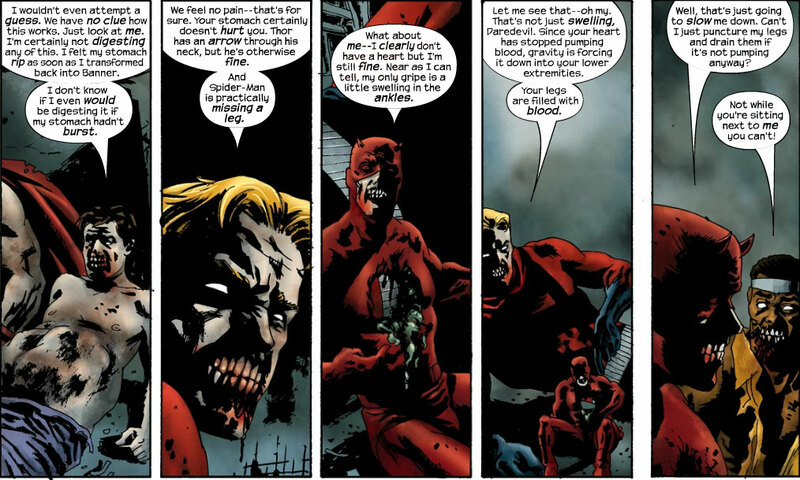 The first five-issue limited series of Marvel Zombies debuted in December of 2005, but it’s taken me all this time to feature it here despite Daredevil starring in a gruesomely delicious role as the undead version of himself. Marvel Zombies launches us into a universe where the majority of the world’s heroes and many other humans have been stricken with a bad case of zombie (exactly how this happened is revealed in a subsequent 2007 one-shot entitled Marvel Zombies: Dead Day in which it is revealed that Daredevil catches the bug from Spider-Man). 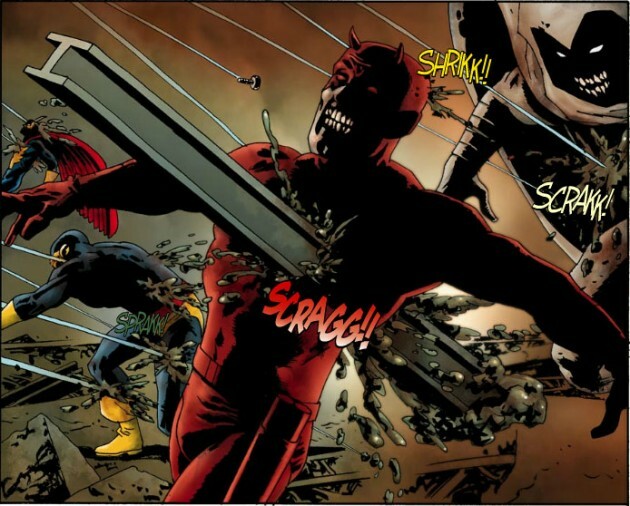 Daredevil doesn’t look very healthy even at the very beginning, but things are about to get much worse early on when he’s struck by a beam which cuts a hole straight through his body. As you can see, he will spend the rest of the series looking like Goldie Hawn’s character in Death Becomes Her. “What about me — I clearly don’t have a heart but I’m still fine. Near as I can tell, my only gripe is a little swelling in the ankles. Maybe I should have saved this one for Halloween, but once I thought of the topic it was so deliciously disgusting, I couldn’t resist! Anyway, as I mentioned right at the start of the post, I should be getting back into blogging again this coming week and there will be a lot of Daredevil-related things to get to this month. I will see you then! One of my guilty pleasures is collecting DD Minimates (I have all but the Evil Shadowland DD). I treasure my Zombie Daredevil … you can totally see right through his chest. Blah.